Ernesto Escobedo hasn't had the best of luck in pro finals. From 2013-15, he reached the final of five Futures events, losing them all. This year he made his first Challenger final and lost that too. When he broke a string at 6-6 in the second set tiebreaker against Frances Tiafoe in today's $50,000 ATP Challenger final in Lexington, he could have viewed it as the tennis fates again conspiring to deny him his first title. But instead, the 20-year-old from California put that misfortune behind him, claiming a 6-2, 6-7(6), 7-6(3) win over Tiafoe, who now has lost in five Challenger finals in the last 17 months without securing a title. There were no breaks in the final set, and both players had good serving days, with Escobedo hitting 17 aces and Tiafoe 15, with each having three double faults. 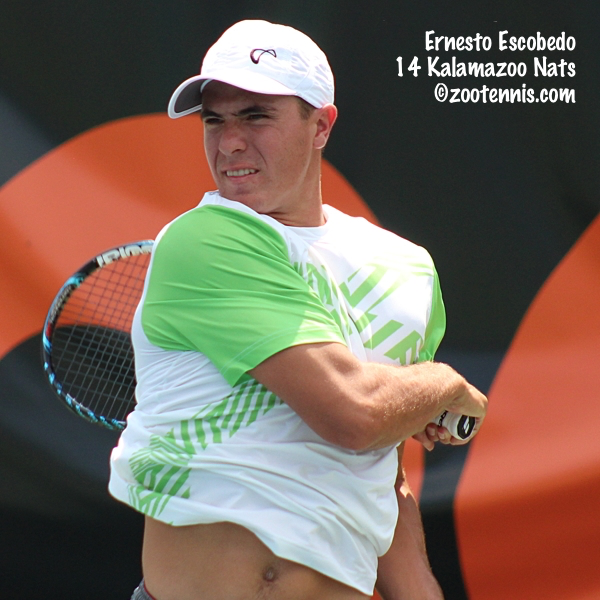 Escobedo played the more error-free tiebreaker, while also hitting two winners to take a 6-1 lead. Tiafoe saved two match points on his serve, but Escobedo closed out the match with a confident overhead winner to claim his first professional title. He will now move within a few spots of the ATP Top 200 and he takes the lead in the USTA US Open Wild Card Challenge, which will be decided in two weeks at the $100,000 Aptos Challenger. 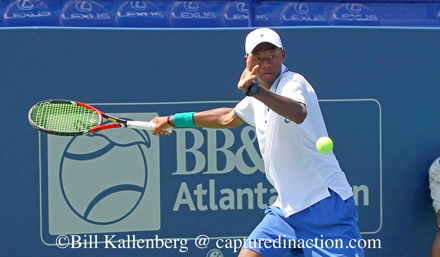 Qualifying for the BB&T Open in Atlanta was completed today, with 20-year-old Chris Eubanks getting an impressive win over ATP No. 104 and qualifying's top seed Thiago Monteiro. Up a set and a break, the rising junior at Georgia Tech let his break slip away and had to save a set point serving at 4-5, but he held, broke the 22-year-old Brazilian, and served out the match to earn 12 ATP points and a place in the main draw against wild card Reilly Opelka. Eubanks had beaten Tommy Paul in the first round of qualifying, after winning a wild card tournament to get into the qualifying, necessary due to his ATP ranking of 1817. Austin Krajicek also qualified into the main draw, with a 3-6, 7-6(5), 7-6(5) win over Australian James Duckworth. Austin Smith, who recently completed his eligibility at Georgia, and Jared Donaldson received wild cards. Smith will play No. 8 seed Taylor Fritz in the first round. Tennys Sandgren ran his Futures winning streak to 10 today at the $25,000 Edwardsville, Illinois Futures. The 25-year-old former Tennessee Volunteer, seeded No. 2, beat No. 8 seed Marc Polmans of Australia 7-6(4), 1-6, 6-3 in the final. No. 4 seeds Connor Smith(Ohio State) and Jackson Withrow(Texas A&M), won the doubles title, beating top seeds Polmans and Luke Bambridge of Great Britain 6-3, 6-2 in the final. At the Austin, Texas $10,000 Pro Circuit event for women, top seed Marcela Zacarias of Mexico defeated 17-year-old Californian Ashley Kratzer 7-5, 6-4 in today's singles final. The women's singles title at the women's $50,000 tournament in Lexington went to Michaela Krajicek of the Netherlands, who defeated Arina Rodionova of Australia 6-0, 2-6, 6-2. Neither player was seeded. At the ITF Grade 2 in Switzerland, No. 4 seed Ashley Lahey lost to top seed Ylena In-Albon of Switzerland 7-5, 7-6(3) in the final. No. 3 seed August Holmgren of Denmark won the boys title, beating No. 2 seed Constantin Bittoun Kouzmine of France 6-7(3), 6-3, 6-2. CiCi Bellis announced during the WTA Bank of the West Classic at Stanford that she had given a verbal commitment to Stanford. I hadn't read a nuanced look at that announcement until a few days ago, which can be found here. With so few juniors in the 150s even contemplating college, there isn't a lot of precedent, but many in the 250s, 300s, etc., set a ranking target for their final year before entering college with the understanding that if they reach it, they will not go. Bellis says she doesn't want to wait that long, mentioning the beginning of 2017 as a potential date for a decision. I don't see Kozlov on the player list for Kzoo...makes me wonder why he wouldn't play unless the USTA already promised him a USO main draw WC. Only three available. Aussie and French reciprocal, college champ (Mackie McDonald), Zoo champ, and Challenger WC winner (Escobedo?) speak for 5 of the 8. Gotta think if Kozlov gets one they are also giving one to Tiafoe and Donaldson, who are also teenagers and ranked higher. All three are deserving--not every year we have one teenager in the top 175 let alone three. But also tons of veterans ranked top 130 but below the cut line who could also get it--Ram, Smyczek, Harrison, Fratangelo, Novikov, Kudla, Krajicek would all be worthy candidates. Tough call for the USTA. I wholeheartedly agree with the previous poster who said the points from ATP level events should also count for the WC challenge. No reason why guys like Ram, Harrison, Novikov, Donaldson should be penalized for choosing to play a 1000 event and then winning multiple matches. While I'm glad to see Escobedo do well, that spot could be going to someone more deserving imo. @Dave I agree with your entire statement except for the fact Donaldson getting yet ANOTHER main draw us open wc? He has gotten 2 in the past 2 years and has done nothing with them and he has not even ever qualified for a slam main draw without a WC. I'd much rather see a Fratangelo, Novikov, Kudla get it as they are still young but have experience in main draw slams. Fratangelo just won a round at French beating Sam Querry and qualifying for Wimbledon. Novikov qualified at Wimbledon and won his first round. Also qualifying in Toronto and beating Delbonis. Fratangelo also did well in DC. Harrison has played well the past few weeks but lets also not forget the amount of main draw wcs he has gotten.... Last year he got one over Novikov and lost 2 straight finals to him. I think that the younger guys i.e Kozlov, Donaldson, Tiafoe, Rubin need to earn there way into the main draw via qualifying or the wc challenge and gain more experience, they have plenty of time and I think the WCs would benefit the older but still young pros much better. Just my 2 cents. Would love to hear what others think on this topic as well. Totally agree USATennis - spread those things around. If every young gun were given one or two in their career, versus a ton of them going to a few like a Harrison or Jack Sock (and even McDonald, although he finally earned the one he is getting this year) and going way back Mardy Fish - we just might see more players break through. Otherwise, the grind is nearly impossible to overcome. I am convinced Sock wouldn't be where he is without the 20+ WCs he received in a two year period. And if a lot of other pros were given twenty WCs, they too would be where he is today. The experience from them alone is worth gold. Jared is 123 in the world. He's 19. There are like two other teenagers in the entire world who are winning matches in grand slams right now. It isn't easy to do, especially when you're 17 or 18. Those other guys you mentioned are within a few ranking spots of Jared and 3-5 years older. Not sure you could have a better candidate for a main draw WC than someone who is not only young but also has results and a ranking that reflect an ability to compete at the grand slam level. And he's been doing that for two years now. But you wanna disqualify him because he lost to Monfils in one match when he was 17 and Rosol in one match when he was 18. Yep, he's washed up. "Spreading them around" is a ridiculous concept. This is pro tennis, not little league where everyone gets a participation trophy. Give it to the most deserving even if it is the same person year after year. And you have absolutely no way to prove whether WCs help or hurt a player's development. I guess you could call it "playing favorites"...I call it giving wild cards to the players who deserve it, which is often the same few players for many different tournaments. It's pretty obvious they try to give the WCs to young players who have had good results at least in juniors or, in the case of JD, Tiafoe, Kozlov, the pros. And while those veterans you mentioned would be highly deserving almost any other year, and I take nothing away from them, I would rather see a WC go to a 19 year old ranked 123 than a 32 year old ranked 105. Or an 18 year old ranked 149 than a 28 year old ranked 116. JD hasn't yet won a main draw match but that doesn't mean he can't compete at a grand slam level. He has won enough challenger matches combined with several tour level matches to indicate that he is capable of beating top 100 players. Same with Tiafoe or Kozlov. If the WCs were going to unproven juniors who hadn't even competed in pro level matches, that's a different story. This is a situation where you have about 10 Americans whose ranking/level is very similar. Obviously not a big difference on tour between 105 and 150. And I believe a young player who has achieved that level is more deserving than someone who has been on tour several years longer. Dave...you make some of the most rationale points....I love the comment from Equitable is better, "I am convinced Jack Sock wouldn't be where he is if it wasn't for the 20+ WC he received..." Look at some of the players he beat when be was awarded those WC's .... Just because you get a WC doesn't mean you will rise in the ranks....USA ha a lost generation of players who received every WC and they never sniffed top 100 let alone 23 in the world. Can mr equitable explain how the WCs got Jack to 23 in the world? I am not following the logic....? 2. Tiafoe- wins over Millman and DY - at IW was 2 points from taking out Gofin (#18) in a thriller. 3. Kozlov- jumped close to 200 spots his year ha I g a win over Steve Johnson and has made the finals of a 100 + H where he beat four pretty tough opponents all ranked between 101-175 in the world. WC's can definitely destroy a players development if they are taken advantage of, but all of these players have earned the right to be considered for these WC based on their ranking development and results. People should also be aware of how the ranking rules work. If a player takes a WC into a GS or M1000 and lose first round they get 0 points which counts towards there best of # of tournaments. So if you take miltipme WC u better be prepared to win matches or your ranking will suffer. Escobedo not deserving? Rules are there for a reason. If these guys wanted to go play challengers and win the wild card they could have done so. It’s more difficult to win a challenger or qualify for a Grand Slam then to win a match or two on the ATP tour. Wild Cards help a bunch in this instance. Ernesto is more deserving than Kozlov at the moment. Winning the same tournament that Kozlov played in and having more consistent big wins recently. They are only a year and half apart in age and ranked between 161 and 205, which according to Dave is not much difference. Dave are you unable to argue your point without changing up what others have said? No one said "washed up" or "give them to 32 year old or a 28 year old" or "spread it around to undeserving players" - that was you twisting other's comments to promote your cause. Examples were 22-24 year old players that are more deserving because they are rocking it and on an upward trend, not leveling. If a player gets more than one WC into a slam and doesn't turn them into a W, the payday should end. Someone else deserves that chance. WCs aren't practice matches, they need to count. I would like to clarify that, for what it's worth, I consider the following players HIGHLY deserving of a USO WC: Ram, Smyczek, Harrison, Fratangelo, Kudla, Novikov, Donaldson, Krajicek, Tiafoe, Kozlov, Rubin, Escobedo, Paul. There is a major difference between saying someone is "less deserving" than saying someone is "not deserving." The conversation started with the observation that there are a limited number of spots available that can't accommodate all of these great players. It is my opinion that based on their 52-week results and their relative youth, Donaldson, Tiafoe, and Kozlov would be the three best candidates for the remaining at-large spots. If that is viewed as a denigration of the other players, I apologize. "If a player gets more than one WC into a slam and doesn't turn them into a W, the payday should end." To make a blanket statement like this is absurd. If the USTA adopted this two-strike policy, they would be giving promising young players two chances to win a tennis match at the highest level, and then cut off, they are done, no matter how much success they have in other tournaments. Two matches! What if they drew Djokovic both years? Are they still fired? Or only if they lose to player ranked outside the top 10. Please clarify your position. @Tom you're absolutely right, the rules are the rules and I'm not recommending that the USTA change the rules now to screw Escobedo after the fact. I would recommend a rule change for next year where someone ranked below the cut line for direct entry would be eligible for the wild card no matter what tournaments they play. Winning a challenger event for 80 points is an impressive achievement, no doubt, but is it as impressive as, say, making the finals of a 250 (125 points)? I would argue not. I think a lower-ranked player who chooses to play higher level tournaments should have the same chance as the players who play challengers. It's got nothing to do with who is better/more deserving, Escobedo or Kozlov...it's just a criticism of what I believe to be a flaw in the rule. If you are qualifying and making a final of a 250 you are going to get a wild card either way. It shows you are consistent at that level. The argument is that winning a match of two on ATP in a row might not be as hard as winning a challenger or qualifying for a Grand Slam. Throw in some wild cards and you have wins on the tour level and points to go with it. There is more luck of the draw involved. Look at Harrison the guy will go on a 1 or 2 tournaments run per year on the ATP level. He will win a couple matches but then has a hard time winning a string of challenger matches or even a match. @Tom I guess it's a matter of opinion. I would argue that beating Kevin Anderson and Donald Young to make the semis of a 250 (90 points) is harder than winning a challenger (80 points). But Opelka's result this week will not help him toward that USTA challenger wild card, and while it's going to move him up about 400 spots in the ranking, it probably won't be enough for the USTA to give him an at-large WC considering all the strong candidates we have discussed, unless he were to win the whole tournament. For what it's worth, there are now four Americans who do not have direct entry into the US Open who would be winning the WC challenge if it were based on all points and not just challenger points. Harrison and Donaldson would each have 110, Ram has 90, and Opelka has 90 with a chance for more. I know you can get easy draws at ATP level, even in Masters', but you can get an easy draw in challengers too. All of the draws are a little bit watered down this time of year because the top players are overscheduled and not playing as many events. That's why they have a point system. Still gotta beat the player on the other side of the net.